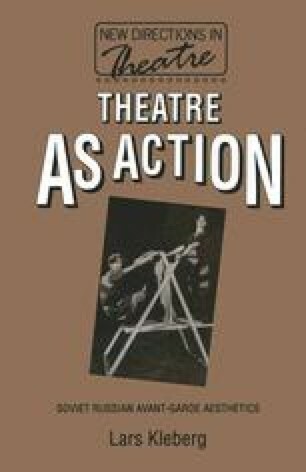 As we have attempted to show, the late nineteenth-century notion of the theatre as the socially most significant art form was based on the concept of the ‘representative auditorium’. The Wagnerian people’s theatre Utopia derived its great moral and political authority from the idea that the entire collective — the nation, the people — was sitting in the amphitheatre or was at least somehow directly represented there. When the actors addressed the audience, they were addressing the collective as a whole. And when the audience joined with the actors in the community of the theatre, this union encompassed the collective as a whole. This chapter is an abbreviated version of my article ‘The Nature of the Soviet Audience’, in Robert Russell and Andrew Barratt (eds), Russian Theatre in the Age of Modernism (London, 1990), pp. 172–95.